This was the world's first UL & CUL Listed low voltage Heated Warming Blanket! Traditionally all UL listed electric blankets in North America operated at 120 volts. 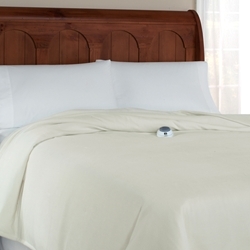 Perfect Fit Industries a premier home textiles and bedding manufacturer, designed and created this heated blanket to operate with non-hazardous low voltage. This technology has allowed them to create the safest electric blanket ever produced. The blanket is machine washable and dryable. For safety the blanket automatic shutoff after ten hours.